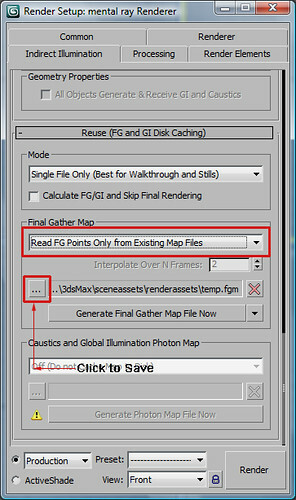 In the dialogue box choose "Read FG Points Only from Existing Map Files" and click on the "..." icon to save the FG map in a directory. And then you can just click on "Generate Final Gather Map File Now". Once you have clicked this, it will generate a FG map by rendering it out. So, when you are creating your FG map you can make the presets lower under the rendered frame window and also render at a smaller resolution but making sure your FG settings are the best. And Once your FG map is created, you can use that same map for the same scene and create a larger resolution render and changing the presets to high quality settings that are under the rendered frame window. By doing this it saves a lot of time as Final Gather computation can take a long time. So if you render the Final gather at a lower resolution it will be faster than rendering at a lager resolution and their is no need to render with FG at a higher resolution as it doenst really matter if you create a FG map.